Lesley Landels is preparing to open a new shop at Drumlanrig Square in Hawick. A Borders designer has cause to wax lyrical over her unexpected success as her handmade candles are proving to be hot property. Three years ago, Lesley Landels was selling a range of her products made in a caravan just outside Hawick at Cavers. Her plan was just to hold table-top sales until her two children, Isla, now five, and Finlay, two, went to school. However, success came faster for Lesley than she had anticipated. A year and a half ago, the 34-year-old opened a shop in Melrose, called Love Scottish Candles, selling, in addition to her scented artisan candles, a mixture of products including cushions, lampshades, soaps and picture frames. 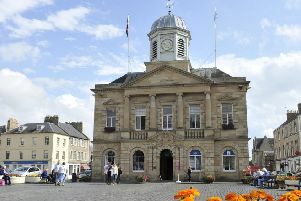 Now she is poised to expand by launching another retail and production unit at Drumlanrig Square in Hawick. She can’t wait to open up, especially as she has thousands of candle glasses and other items clogging up her home at Cavers Mains, near Denholm. Recalling how her booming business got going, she said: “It started about three years ago. “We were in caravan just outside Hawick at Cavers. I had studied textile design at uni, so I’ve always been a bit of a maker and I wanted to produce products for my shop, but I had two kids and it was kind of put on the back-burner. “When Finlay was just a baby, I started to potter with the candles and I was either going to study accountancy or try and do the candles, and it has just snowballed from there. “A year and half ago, I opened Love Scottish Candles in Melrose, and now the production has kind of grown because I wholesale them as well. “I’ve made over 10,000 in the house, so I’m needing them out, basically, and then the unit came up at Drumlanrig Square. “I can’t wait to get into the shop. There is just stuff everywhere in the house. “I have got 1,000 candle glasses sitting in my hall, so it is time to get them out. “The Melrose premises is staying open, and I have four staff now, and the office and production will be run out of Hawick, and there will be a retail space there too, once production is set up first. “I used to take a pop-up shop once a month in Hawick but that has closed now, so I have lost that outlet, and the new retail space will give us the chance to open our doors to the public. “For me, production-wise, this is quite a good time because it’s a bit quieter. Love Scottish Candles, a finalist in the innovation and manufacturing classes at last year’s Scottish Borders Business Excellence Awards, run by the region’s chamber of commerce, is scheduled to open in Hawick at the beginning of next month.